Five Point Move is proud to host USA Greco-Roman National Team head coach Matt Lindland each week for Coach Lindland’s Report. 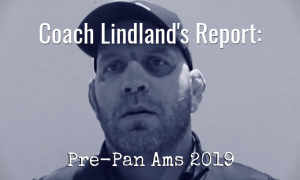 Here is where you will find detailed perspectives from Coach Lindland regarding results, training, upcoming events, and other Greco-related news that isn’t available anywhere else. 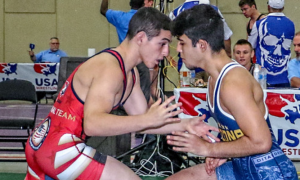 ALSO — if you would like to donate directly to the US Greco-Roman program, just click here. Your support is appreciated! 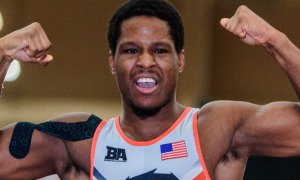 This past weekend saw Kamal Bey (77 kg, Sunkist) stomp to gold at the 2018 Granma Cup in Cuba while both Dalton Roberts (60 kg, NYAC/OTS) and Kevin Radford (87 kg, Sunkist) nailed down bronze. These medal performances are obviously a part of this week’s report along with some talk about Alex Sancho (67 kg, NYAC) and his results. 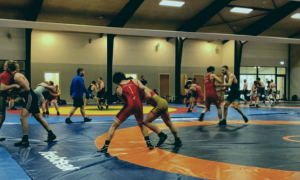 Also included is a recap of the camp and dual in Boise that took place for Seniors two weeks ago, as well as Lindland’s thoughts on the impending US trip to Denmark. 5PM: If there was a goal for the camp in Boise, what was it and was it achieved? Coach Matt Lindland: Yes, absolutely, there were a couple of goals. One of them was to learn more from Ivan (Ivanov) and not just understand how to use his equipment better, but how to program it more effectively due to the fact that he has so many different programming modalities. He’s got speed, he’s got power, muscular endurance, and just getting to pick his brain and find out when to implement certain types of training. Because, he’s the creator, he’s the designer, everything that has come out of Suples training is due to Ivan, so there’s no one better to learn from than he. That was one of the goals and part of that had to do with getting the athletes excited to use his equipment while learning directly from him, and then having a good idea (of how to do so). We’ve been using it everyday since we’ve been back, and we’re going to continue to because we have the stuff in our room, but the fact of the matter is we were very limited in how we implemented the tools. Sure, we’ll use the bags, sure, we’ll use the dummies for gutwrenches and different stuff, but how to get the most out of every piece of equipment, because you look at this stuff and you’re like, This has one or two purposes. And then you watch Ivan and every tool has multiple functionalities and different ways to utilize it. That was a big goal. The other one was certainly to get matches, go out there, and put on a show for fans who wanted to be exposed to Greco-Roman wrestling. I don’t think we accomplished that one. I said it before, but I think we were a little hesitant and a little timid. We’ve had good conversations and in the room we’ve seen guys get out there and execute, so I am hoping this carries over to our tournament in Denmark that we’re leaving for because I feel like the guys knew the goal, and knew that they fell short of the goal of going out there and making multiple attempts, attacking, and taking risks. It’s really important to take risks in this sport. Courage is necessary. Avoiding risk is a sure way to fail in Greco-Roman. There’s no way around that. If you are going to compete, you have to take risks and take those opportunities. You don’t want to leave it to chance. I’d rather see our guys go out swinging and trying things than just losing the match. Watching our athletes this past week of training, I think they got the message because I’ve seen a different sense of urgency, and that was something I talked about a lot. We need to make things happen now. I’m not panicked about it and I don’t want my athletes to be panicked. But I do want them to have a true sense of urgency. It’s a fine line of panic between, Yeah, we need to get results and, We need to get results, we need to do what we need to do. We need to put the time in, we need to put the effort in, and we need to take serious risks and be courageous out there on the mat. To boldly go out there on the mat and attempt things. So I think we’re going to see a lot of the guys change the way they compete. I even saw it in Cuba. I mean, up and down. We got three medals, which was was great, we got good results. But more than that, I just thought the guys competed hard, went after it, they took risks, they tried things, and I didn’t see that in our Boise dual meet against the Serbian team. And I feel like the guys aren’t as worried about letting me down as they are letting themselves down. It seems like that is an area they are already starting to correct. 5PM: You alluded to Cuba, so let’s go there right away. This tournament carried more weight than usual since it’s a Ranking Series event. Your gold medalist (Bey) outscored four opponents 37-6, all tech’s. It was a giant bounce-back performance for Kamal following the dual. You’ve watched his matches and I’m sure you’re glad he won, but what was your most important takeaway regarding how he won? ML: Wow, speaking of not panicking but having a sense of urgency. I feel like that is what Kamal is starting to get. I’ve been working with him and coaching him for a number of years now and he’s a guy who doesn’t want to have a close match. He tech’ed everybody, but he had a lot of close first periods. He was losing a match in the first period, he was down by one. He was up one point in another, and they were close matches until he scored. He opened it up, scored more points, and tech’ed guys out. He has the ability to do that at any moment. So when I see him and he’s losing by one point and there are four minutes left in the match, and he’s panicking, giving up underhooks, giving up better positions and fighting his way through things, it’s hard to watch because I know what he is so capable of doing. At this tournament, I felt like he waited for his opportunities and when he got his opportunities, he made the most out of them. That is something everyone on our team needs to learn from. You’re not going to get too many opportunities, but when you do, you have to strike. And not just strike once, but try to score multiple points. 5PM: Dalton Roberts went out there and lost his first match pretty big time, then won his next two pretty big time. He dropped a tough match in the semifinal but came back for third and controlled the German’s life. You watch him a lot, I know you have an affinity for his style, and this event was a step up for him. What does a bronze here at this specific stage in his career say to you about his progress? ML: Well, I’m not so concerned about the medals or the wins, I just love the way Dalton competes. He competed so well at the U23 World Championships, it was heartbreaking to see his opponent lose his next match with two seconds left and not bring him (Roberts) back into the repechage. But Dalton competed very well there and seeing him make these improvements at the Senior level, he’s just a first-year Senior and he still has two more years at under-23, as well. I think we’re going to see a lot of Dalton Roberts really soon. I think we’re going to see a lot of him on podiums. He does things right. He lives a great lifestyle, he works very hard, he is relentlessly attacking, and he is eager to take risks. He is very courageous. He makes multiple attempts, he attacks, and he doesn’t hesitate. He puts himself in dangerous positions to try and score. Sometimes he fails, but he is going to fail fast and he’s going to figure it out. And we’re going to see him continue to excel in this sport. I am very optimistic about Dalton’s future, I think he is one of our up-and-coming stars, absolutely. He’s a late bloomer, I don’t think the guy has a whisker on his face yet. When he starts to really mature as an individual and as an athlete, he has the right mindset and he has the right attitude to where we are going to see a lot of success from him in the future. 5PM: Alex Sancho lost three matches to two guys. One of them also happened to be one of the best wrestlers on the planet. Coming off the U23’s, it was going to be interesting to see how he did in Cuba no matter what, but did you hone in on anything regarding his performance from the weekend that concerned you? 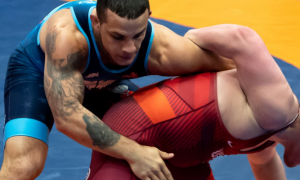 Well, outside of losing to Borrero (Ismael Borrero Molina), who is arguably one of the best wrestlers the world has ever seen, I mean really, that guy is incredible and not just at 59 kilos. It took him a minute to adjust. We saw him move up at Takhti and he had mixed results, but he really picked up his game. That was one of the most beautiful arm throws I have ever seen. Sancho definitely tried to get off the move, he tried to cartwheel over. You know, Sancho is a courageous guy and he steps up to everybody. He just didn’t have a good weekend. He didn’t compete up to the best of his abilities, but that’s alright. Maybe he’s just getting settled here, he has only been out here for a couple of weeks in Colorado. We sent him over to Cuba right away. I don’t know, I have to get with him some more, spend some more time with Alex. I have worked with Alex in and out of camps, but never on a daily basis. And like I said, he did just get out here to Colorado Springs the last couple of weeks. We were finishing up a strength cycle and barely started getting back on the mats. But he’s coming over to Denmark, he and Kamal are both coming over for the camp portion of that trip. They’re going to do a couple more days of training in Cuba and then come over to spend two weeks training with us in Denmark. So I’ll get a chance to work with Alex. I’m sure he just didn’t have a good tournament. I mean, that happens. That’s life in this sport and he is a very tough guy, he is a very talented athlete, and I expect him to do great things. How long is it going to take him to get there? I don’t know yet. We’re going to have to evaluate those things. It wasn’t his best tournament but he battled everybody, he went out there and competed, and lost. That happens. But I’m not concerned. I know what kind of competitor he is and how talented of an athlete he is. I’m just looking forward to continuing to work with him, help him improve, and reach his goals. 5PM: The United States’ participation in Thor Masters, from a fan perspective, is awesome. It’s great to watch the US athletes get out there with a lot of these great Scandinavian and European athletes who don’t get a lot of attention here normally. What is the main value you see out of the US entering this event, and also, what is it about the event and Denmark that you like personally? ML: First of all, it’s our third year going there and it has gotten better every year. They have increased their number of participants, they have increased their number of countries going, we’re going to have 18 countries there I think and about 150 participants. It’s the Nordic System, so that means athletes are going to get multiple matches in. Even if they do lose, they are going to get a chance to come back and wrestle again. It’s not a repechage type of tournament where you have to get pulled back in. Everybody is going to get in there. They run a great event. It’s a first-world Western country and we don’t go to very many of those, so that is always enjoyable, when everybody speaks English. So that’s nice, I feel really spoiled when I go to a country like Denmark, Hungary, or Germany. It’s nice, it’s a nice break, because sometimes you feel like you need to rough it a little bit with your guys so you’ll go somewhere and sleep on a box spring in Misk. But it is nice to have the comforts of a Western type of country, to tell you the truth. I like the coaches from the Nordic countries and I can talk to them, I can communicate with them, they speak English. Whether it is Norway, Finland, or the Danes, we can all communicate on a pretty easy basis, we don’t have any language barriers really to speak of. They all speak English and it helps me out, I don’t have to know a bunch of different languages. Plus, they are all guys who competed around my era, so we’re pretty close as far as building friendships, relationships, and getting to know one another. I like that about the sport, the camaraderie not just with the athletes, but the coaches, as well. We’re all in this together, we all have similar goals and aspirations, but we’re all competitors at the same time and I really appreciate that part about it. 5PM: These trips overseas, the camps are always a big deal, they are a giant part of this. We talk about camps, we talk about how important it is for US athletes to work with foreign partners, but how does time of the season impact the approach? Is that on an individual basis for guys in regards to items they want to make adjustments on? How does a camp now relate to preparation for the tournaments like the Open and the Trials? In other words, what role does a camp like this play when it comes to timing? Coach Matt Lindland: I think the timing of this camp is ideal because we don’t have anything until the end of April. This is going to be the end of February, so we have a big gap before our first tournament here. And to me, the US Open isn’t that important. If you’re not in the top-7, then you’re probably not someone who we’re focusing on anyways. Certainly, the guys want to win, they want to perform well, and rightfully so. 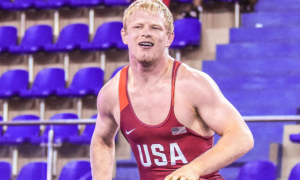 They want to get themselves seeded at the World Team Trials and get themselves into the finals of the World Team Trials, which also qualifies them for the Pan Ams. So they want to perform. But I don’t think our guys are even looking towards being at their best for the US Open at the end of April. Everything is really about making that Team and performing at the World Championships. So as far as timing goes for this camp, it’s incredible because we’re going to get an opportunity to get a lot of live go’s. This camp is not so much about technical wrestling. A lot of that technical work is done during the first part of practice, the warm-up, really. Grab a partner, play wrestle, hit some techniques, and then go live. But getting an opportunity to compete, maybe you lost to somebody and now you can figure out how to not get hit with that same technique. I’m not talking about winning or losing, I’m talking about fixing your errors. Where did I make a mistake in this match and how can I improve it and not let that happen again? I think that is part of what we want to do, but certainly, getting together with all of these other coaches and athletes, everyone is pretty open to sharing ideas. It was nice, we had (Heiki) Nabi out here (in Colorado Springs) and seeing him help our athletes and just watching him share with our guys… It’s one thing when your coaches are telling you, but you kind of start to hear those voices too often, so it’s really nice to hear from someone who is really current, has been a World Champion, has been on the podium at the Worlds and European Championships multiple times. I know we’re going to see a lot more of that in Denmark. These guys stay after practice 20, 30 minutes and it’s, Hey, what was that technique you hit and how did you turn me? And then they start fixing things and making those adjustments. That is really fun to watch, when these guys stay after practice and try to pick the brains of the other coaches and athletes. That’s really what I get excited about, seeing our guys wanting to learn, wanting to get better, seeking that out, and putting the time in to do it. 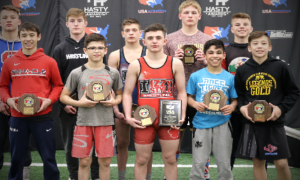 Be sure to follow Coach Matt Lindland on Facebook, Twitter, and his official blog for updates on the US Greco-Roman Wrestling program.